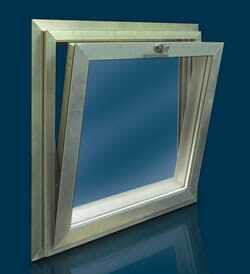 The Keltic 7223 Series windows feature the AZON’s MLP™ (Mechanical Lock Profile) thermal break total design system. It offers the best balance of energy efficiency and high strength for aluminum fenestration products used in the most demanding climates and conditions. 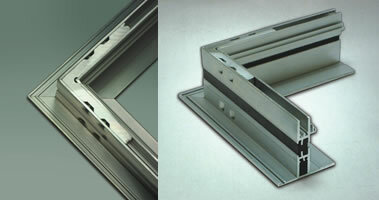 These windows also feature the heavy duty corner keys to reinforce the mitered corners. The Keltic 7223 Series Commercial Hinged Windows utilize top-of-the-line “Heavy Duty 4-bar Friction Hinges” which ensures smooth operation. These windows also feature the AZON’s MLP™ (Mechanical Lock Profile) thermal break total design system to improve thermal performance. When energy efficiency and optimal ventilation are a priority, the 7223 is perfect for your next residential or commercial property project. 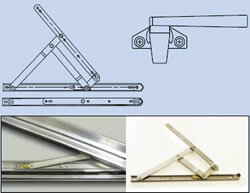 The Heavy Duty 4-bar Friction Hinges have been designed to be used for commercial projects requiring relatively heavy window sections and ensure smooth operation. 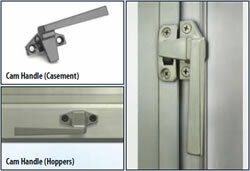 The Cam Handle is designed to provide long and trouble-free service. Two-piece strike design includes a polyester insert to provide a smooth operation and reduce wear. It will increase both security and weather seal tightness.